Can sizes are given in the nomenclature usually employed in the industry, which avoids the confusion of conflicting local names of cans. 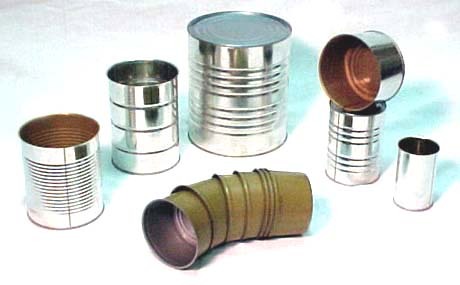 In this system, the cans are identified by a statement of their dimensions (overall diameter and overall height). Each dimension is expressed as a number of three digits. The first digit gives the number of whole inches, while the next two digits give the additional fraction of the dimensions expressed as sixteenths of an inch. The first number given in the size of each can is the diameter, and the second number is the height. For example, a can designated as 303 x 406, is 3-3/16 inches in diameter and 4-6/16 inches in height, with in the manufacturing tolerances. The dimensions are ''overall'', the diameter being measured to the outside of the double seam., and the height including the entire seam at each end of the can. The following table lists the dimensions of common sizes used in industry and their approximate metric equivalents. The metric equivalents were calculated on the basis of 1 inch equals 25.40 millimeters. EZO ends require special can seamer retooling. This is a special order inquire for specifics. EZO ends require special retort processing controls. For home canners safety, EZO ends are sold to licensed canners only or qualified accounts with proper equipment. Home can seamers require a special machined turn table or base plate. This base plate must match the bottom profile of the can being seamed so the can will close properly. When ordering tell us what product is to be canned/ packaged so that we may recommend the best lining to fit your needs. For more information on two piece cans click here. These are the special turntable base plates required to seal two piece drawn cans to the manufacturer's specifications. Embarcadero Home Cannery base plates are custom machined to those specifications.